The fog that fills Trigan City is not naturally occurring, although the only person who correctly identifies the problem is a blind beggar, Uruz, whose hearing has become greatly attuned to his surroundings. The red weed envelops Trigan City and the citizens flee to the hills, leaving the stricken city in the hands of Lokan slaves. As the weed crushes the city, it becomes clear that it is only the vanguard of a full-scale invasion by warriors from another planet. In the fourth Lunar month of the year of Yedd, the ‘Princess of Vorg’, largest ocean-going liner ever, was launched in Trigan City harbour. The liner spanned the ocean, with amongst the passengers Trigo, Janno, Peric and Salvia. All seems safe, but disaster threatened! In the swamps of Florida a UFO crashed somewhere in the late thirties. The spaceship resisted the impact en onboard men found the dead crew and a collection of books with inside the chronicles of the Trigan Empire. Scientists from all over the world tried to encrypt the books and after many years one of them found the way to translate the books. Thanks to this man the whole world gets to know the history of the rise and fall of the Trigan Empire. With this introduction in the magazine Ranger The Rise and Fall of the Trigan Empire was introduced to the readers of ‘the magazine for boys’. It was a prestigious project, for which the editor had hired two top talents. Michael Butterworth wrote the scenarios for this space-opera and Don Lawrence drew the artwork. 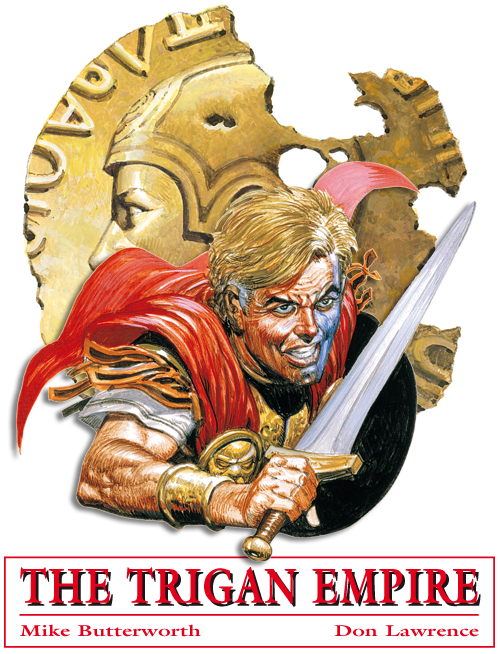 A great combination, because thanks to their talents, the Trigan Empire became one of British most popular comic strips.